At Signal 88 of York PA, we strive to provide our clients with total peace of mind. As such, we are committed to providing our clients with rapid alarm response services, delivered by skilled professionals using today’s most cutting-edge security technologies. 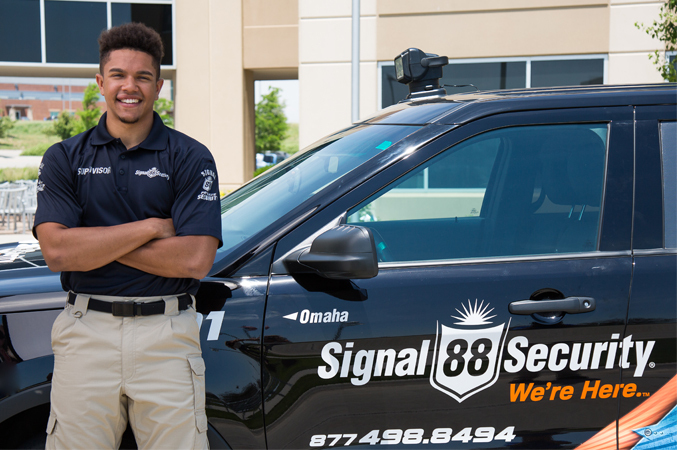 Known for our customized security solutions, including mobile patrol security services, Signal 88 of York is the perfect partner for your alarm needs. Thanks to our 88Edge® suite of security technologies, we have the cutting-edge monitoring, dispatch, and response capabilities you need in a security services provider. Meanwhile, we boast one of York’s most skilled, respected, and highly trained teams of security personnel. Discover the advantages of alarm response services from Signal 88 of York and choose peace of mind for your property. When something sets off your security system, you shouldn’t need to worry about who’s answering the call. With services from Signal 88 of York, you won’t have to. We’re committed to providing our clients with rapid response to onsite alarms and other security event. To make this possible, we rely on our one-of-a-kind suite of security technologies and we’ve recruited a team of highly trained, highly skilled security personnel to respond to our clients’ needs. Our 88Edge® suite of security technologies puts the framework in place for effective and efficient alarm response in Philadelphia. Our control center monitors your site’s security systems, jumping into action the instant an alarm becomes active. With 88Edge® was can quickly identify the nearest available response personnel and track the fastest route to your site, allowing our mobile security personnel to arrive within minutes to your site. Our personnel arrive in highly visible mobile patrol vehicles, which send a strong and clear signal that security is present. Once onsite, we will investigate the cause of the alarm and document our actions and findings in a real-time report. This report will keep you up-to-date on our response minute-by-minute and will allow you to monitor the situation remotely. Alarm response security from Signal 88 of York is available for buildings and properties of all kinds. We provide mobile patrol security and response services for residential properties, commercial properties, and industrial properties in the York area. In addition to York, we also service properties in the surrounding areas. Our complete service area covers York, Lancaster, Harrisburg, Carlisle, Shippensburg, Gettysburg, and other nearby communities. Call Signal 88 of York today at (717) 686-9588 for more information on our alarm response services in the York PA area and request a security consultation.